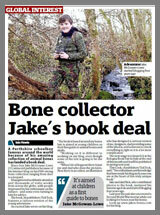 After being on Winterwatch last week, I have got a lot more followers on Facebook and Twitter. 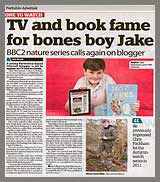 You are probably expecting me to write about bones, but instead I am going to write about something else very odd which happened as soon as I came back home from the filming. I brought up my trail cam up to Winterwatch in case I needed a prop when I was talking about filming the pine marten. When I came back, the first thing I did was leave my trail cam back to the area where I have been tracking it trying to find out where it lives. After I set it up, I searched around looking for fresh droppings or other signs, and then I noticed something VERY peculiar underneath the roots of a up-turned tree. 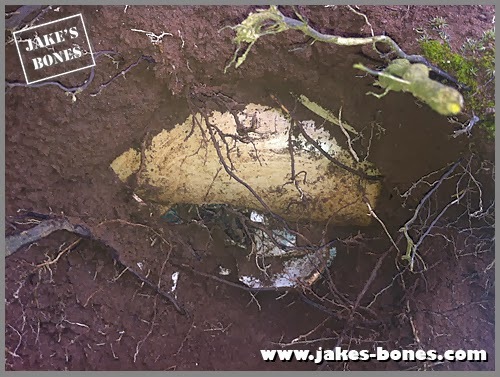 I've found weird stuff in the roots of fallen down trees before, like an unexploded world war II bomb or an old cow bone, so it was definitely worth a look ! This is what I saw first. 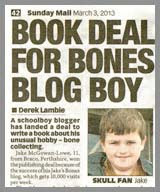 It was very peculiar, the colour of bone, but too smooth and without suture lines. Then I thought it was maybe an old water pipe, because there used to be an old farmhouse on this very spot. I wrote before about the history of other 1800's farmhouses nearby, and this one was lived in by someone from the same Monteath family. 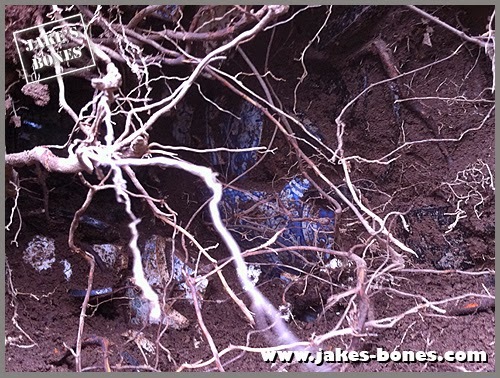 I brought up a bucket and a trowel and started digging into the roots. The soil was soft and powdery so it was easy, but the roots made it difficult. 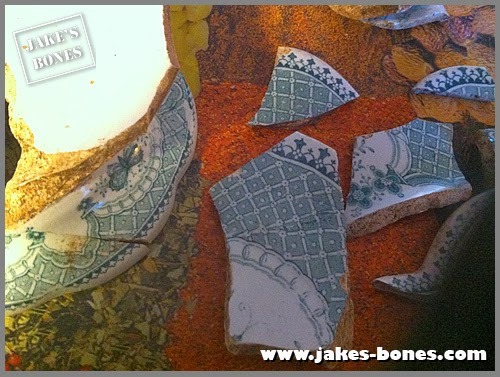 There was a very small area, maybe a cubic foot, crammed with broken crockery, plates and bottles ! 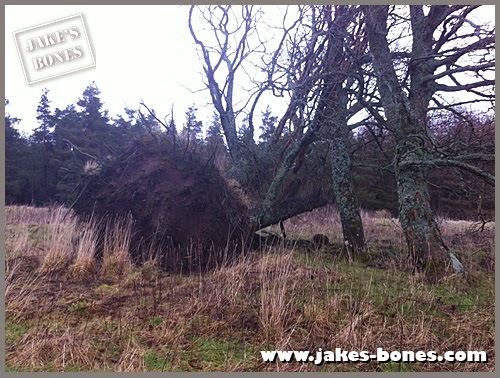 It had been buried about a foot under the ground, and was only visible because the tree had been uprooted. 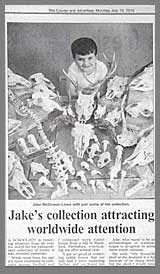 I very carefully sifted through it, and collected all the pieces I could and took them home. Was I allowed to keep them, though ? For some sites, like the old Roman fort in my village, you are supposed to leave anything you find and get experts to dig it up. But I could tell that these were old, but not that old. The glass bottles were thick and uneven glass, with no thread at the neck, but without a visible seam. That made me think they were quite old, maybe a hundred years. But does the person who owns the land own them ? Probably, but they were in such a smashed condition that I doubt the landowner (Scotland's richest man !) would want them. But if he asks, I'll give them back. 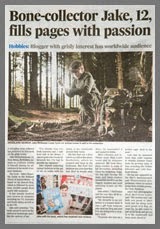 This was the big bits of the first project. I thought it was some kind of bottle or container, about a foot tall. There was one large part, which was the bit I found, and everything else was much smaller. 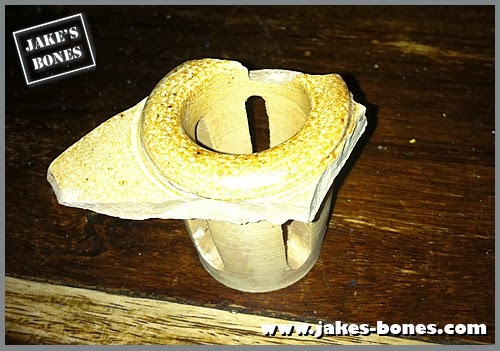 This is what it looked like when it was glued back together (apart from the weird bit which went in the front). The puzzle was, what would you keep in it ? First I thought maybe seed or grain, because the opening was like that on a bird feeder. But the puzzle was, why was it half way down, not at the top or bottom ? Then it struck me: I was looking at it wrong ! 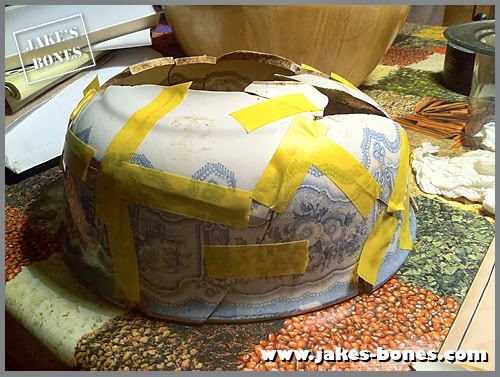 One side was flatter than the others, and it was the opposite side to the opening, so I realised it lay on its side, then I realised it must have been an old hot water bottle ! The cork or stopper must have been lost. So when did it date from ? 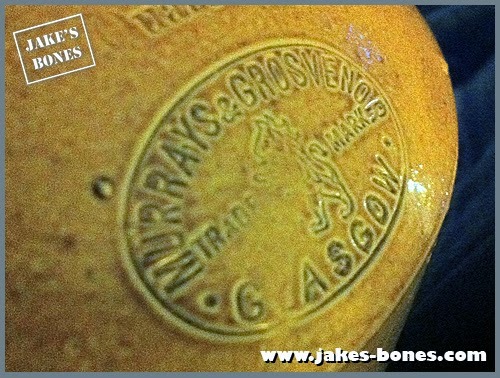 It was embossed with a mark saying "Murrays and Grosvenor, Glasgow". 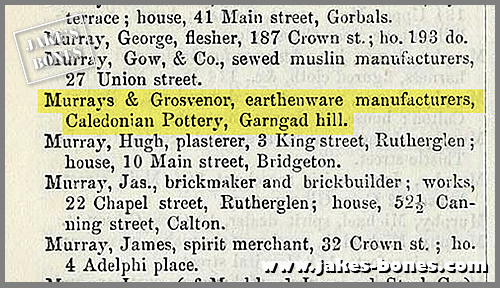 I emailed a ceramics expert at a museum in Glasgow, but then I found that mentioned in an old Post Office directory of 1865 and 1868 saying they were based at a place called Caledonian Pottery. 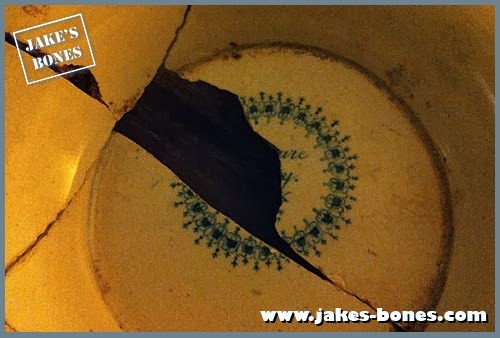 This website says they produced pottery there between 1800 and 1897. So it was at least 117 years old, but could have been 200 years old ! But the company is only mentioned in the Post Office directories of 1865 and 1868 despite the directories being updated every few years. So I think it was about 150 years old. That was a cool find ! This was very tricky. A large blue bowl, the size of a fruit bowl, had been smashed. Gluing it back together was very difficult, especially as some of the pieces were missing. 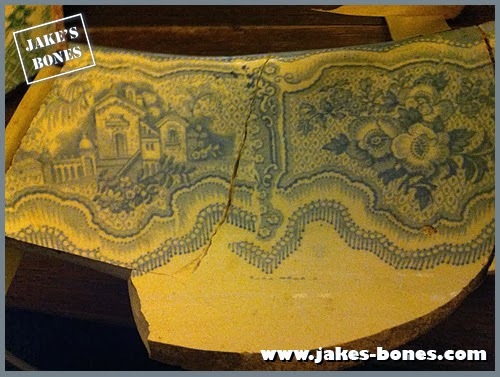 It was thick and ceramic with a pattern that shows flowers and an house in the country. ...who shows that the pattern was on a flat sheet then applied to the round bowl instead of being hand painted.. 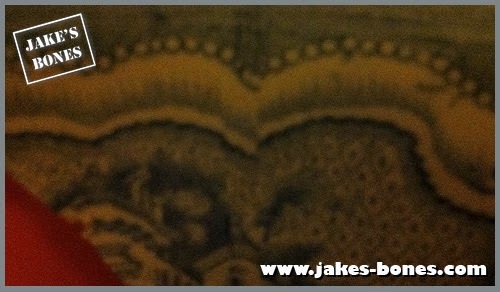 This is called transfer printing, and was a way to make plates look expensive, but make them quite cheaply. That makes sense because whoever lived there was unlikely to be very rich. 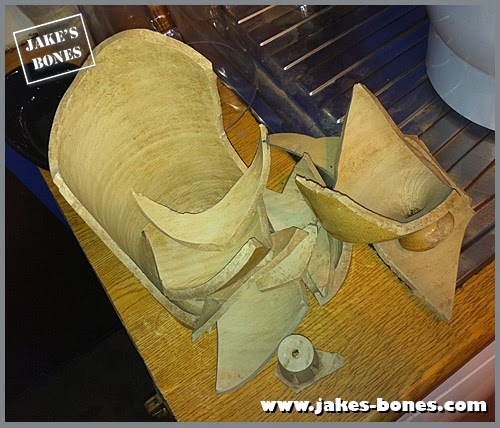 There weren't any makers marks on the pieces I found, but this bowl could actually be quite recent, say from 50 years ago. 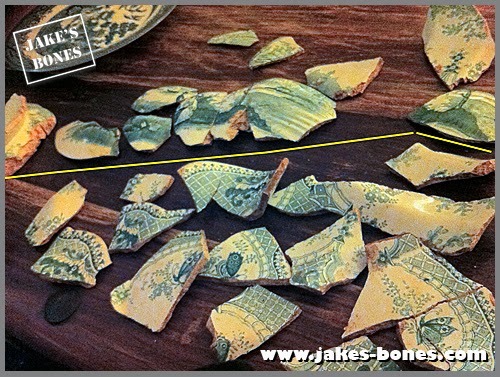 There were a load of pieces which were a fine green/white pattern. When I looked at them closely I realised there were two types. The thicker ones were printed on both sides with images of a rigging pattern and pictures of butterflies. 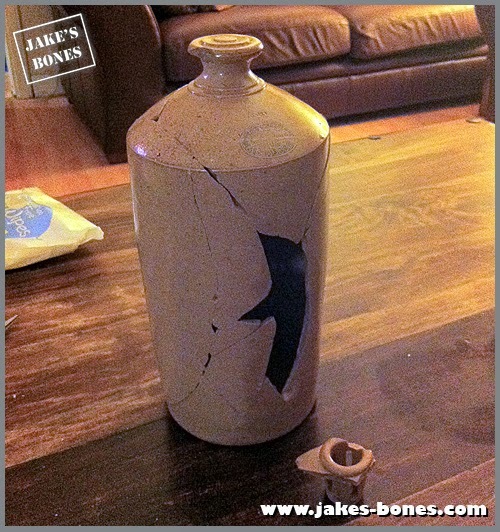 Unfortunately, the one bit of the vase base showing where it was made was missing ! 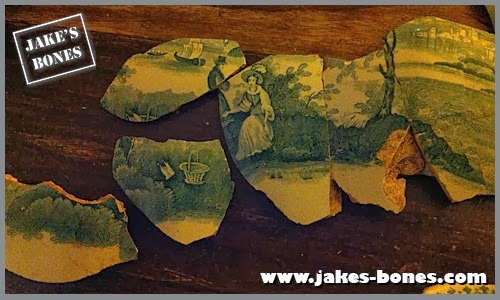 The thinner pieces were unevenly round and show a scene of a man and a woman with a basket dressed in maybe 18th century clothes by the side of a river with an old temple and tower on the other side. I found some pieces which showed the same part of the image, so it must have been printed twice, maybe on each side of a jug. This might seem boring to you but to me it was a good find. It's weird to think that the glued together hot water bottle now in my room might had warmed the feet of someone 150 years ago ! Next week I'll get back to writing about about how I rearticulated the badger which I showed on Winterwatch, like I promised ! 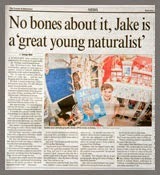 Fascinating Jake... makes a change from standard jigsaw puzzles!! hey jake! i'm going to try and mail you those raccoon skulls again! its me Emmy/Emryss they never made it to your place did they? 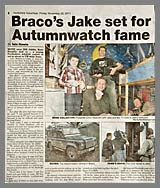 Time Team Braco! 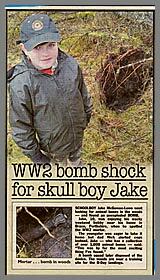 great sleuthing, Jake. I just wish I had all the pieces ! No they didn't. That would be really kind. I just wonder what else is out there in that field ! Jake! Unless I'm very much mistaken, your first ceramic item is indeed a pig. 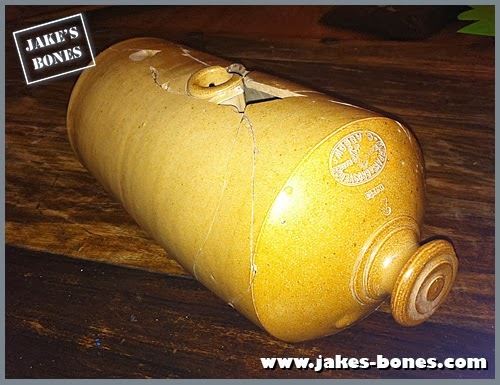 It was used as a hot water bottle to warm up the bed before they invented rubber ones. When I stayed with my Granny in the early 1950s that's what she put in my bed to warm it up. What brilliant finds! Expertly reconstructed, too. You might want to add a small plastic potting sieve (around 19cm diameter) to the equipment in your rucksack. 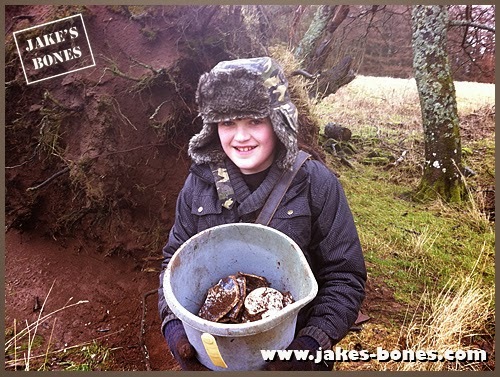 That way you can sieve soft soil around finds to make sure you get any small bits. 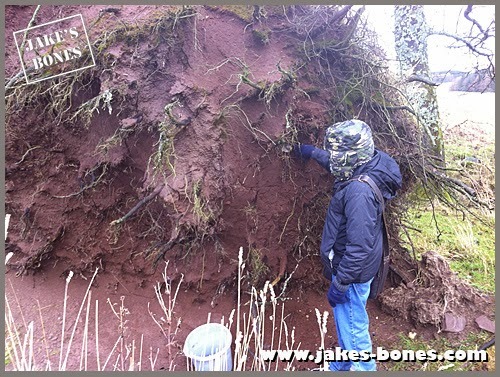 This technique works well with dry soil, though if it's wet (which is mostly is at the moment) you might need to pour water through the sieve to wash the soil through – I appreciate this is not always practical when you're a long way from home. :) lets give this another try! aha! 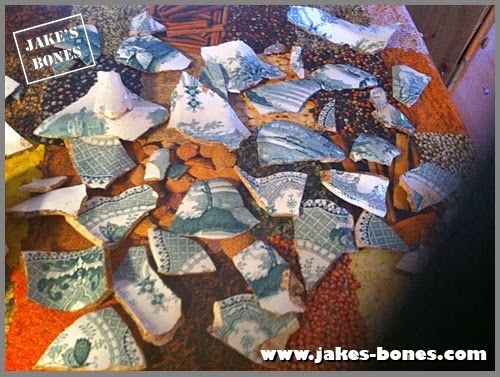 Oooh, I love finding bits of old crockery like that! We got a fantastic haul from beachcombing in Dumfries and Galloway this year but of course you never get to piece anything back together that way as the sea will have scattered everything! I wish I'd find something like this. It would be fascinating to know how it all ended up there. I wondered that too. 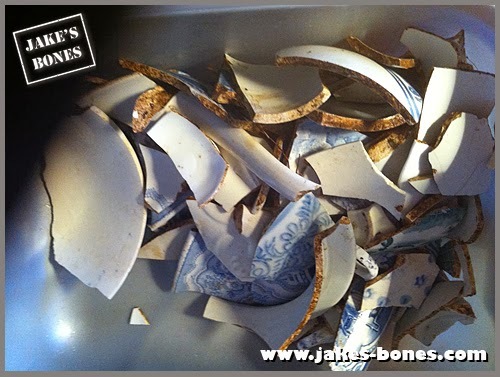 I wondered if all the crockery was just buried when the house was cleared out.